Borrowers who are struggling to pay off mounting credit card bills, loans or their mortgage may consider debt forgiveness programs, bankruptcy or foreclosure as a last resort. These options - some voluntary, others not - can unload large balances and give borrowers a fresh start in rebuilding their finances. However, many Americans may be unaware that certain types of forgiven or canceled debt can follow them into the next tax year and weigh on their liabilities. The Internal Revenue Service treats many types of forgiven debt as taxable income. When lenders agree to forgive a portion of a consumer's credit card balance, for example, they are required to report the details to the IRS. The federal agency will then send borrowers a 1099-C Cancelation of Debt form at tax time, outlining the amount that must be included in their taxes. For example, if a borrower is carrying a $10,000 credit card balance, and a lender agrees to forgive $4,000, that amount must be included as income when a person fills out their returns. While canceled credit card debt is almost always considered taxable income, there are other scenarios in which other types of forgiven debt do not fall under these rules. Foreclosure is one instance in which additional protections may shield previous homeowners from being forced to report their losses as income. The Mortgage Forgiveness Debt Relief Act was supposed to end in 2012, but was extended during negotiations between lawmakers in 2013. The legislation, except in special circumstances, absolves homeowners of paying taxes on their canceled mortgage debt. There are other circumstances in which the IRS is not permitted to tax borrowers on forgiven, canceled or discharged amounts. Any assets discharged through bankruptcy protection are typically not included in a person's taxable income. The same holds true if a borrower's debt was canceled while they were legally considered insolvent. 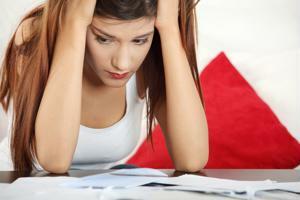 A person is considered insolvent when their liabilities exceed the value of their assets. However, it's important to note that this exclusion only applies up to the amount in which a person was insolvent. When determining insolvency calculations, it's important for individuals to work with a licensed tax preparer to ensure they are reporting the right amounts. Failing to do so could land them in trouble with the IRS. For those who are struggling to pay off various types of debt, keeping records of any forgiven or negotiated amounts and settlements is important, and may make filing taxes easier. For a more in-depth look at Liberty Tax Service®s, visit the Give Me Liberty! Magazine. Follow Liberty Tax® on Facebook and on Twitter or contact Liberty Tax® directly at 1-877-at-Liberty. Liberty does not make any promise, warrant or covenant as to the transferability of any credits earned at Liberty Tax Service®. Credits earned at Liberty Tax Service®, may not transfer to another educational institution. Credits earned at another educational institution may not be accepted by Liberty Tax Service®. You should obtain confirmation that Liberty Tax Service® will accept any credits you have earned at another educational institution before you execute an enrollment contract or agreement. You should also contact any educational institutions that you may want to transfer credits earned at Liberty Tax Service®, to determine if such institutions will accept credits earned at Liberty Tax Service® prior to executing an enrollment contract or agreement. The ability to transfer credits from Liberty Tax Service® to another educational institution may be very limited. Your credits may not transfer, and you may have to repeat courses previously taken at Liberty Tax Service® if you enroll in another educational institution. You should never assume that credits will transfer to or from any educational institution. It is highly recommended and you are advised to make certain that you know the transfer of credit policy of Liberty Tax Service®, and of any other educational institutions you may in the future want to transfer the credits earned at Liberty Tax® Service, before you execute an enrollment contract or agreement.